for ELAC Technische Software GmbH. NEW! Free Upgrade to CARA 2.2 Plus! CARAPatchV22.exe: Executable zip containing updated files for CARA 2.2 PLUS. This patch updates CARA to version 2.2 PLUS. There are minor improvements in very many program modules and a considerably enhanced 'Loudspeaker Editor.' Download the patch and extract the files contained within the zip to your CARA program directory (Default: C:\Program Files\ETSKIEL\CARA21P\). NOTE: the patches here are the same as the ones available from the ETS Website. If you have patched from that site, you do not need to run this patch. Looking for a specific loudspeaker profile? 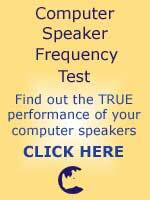 This link goes to the ETS "CARA Loudspeaker Forum" database. Look under downloads to see both CARA-created and customer-created loudspeaker files. There is also a wishlist where you can request a certain loudspeaker. Contains user created objects such as couches, tables, chairs, rugs, and other objects you could possibly have in your listening room. Objects are importable into your CARA CAD design by going to EDIT->Load Group. A group is merely a way of putting other objects together to be just one item. A couch, for instance, is actually made up of 4 or 5 3d objects. Grouping them makes them act as one object. This allows you to build objects that are more true to real life. You can create your own groups for sharing, backup, or ease of control by Highlighting the objects you wish to group and going to Edit->Group. Then you can save your group by going to Edit->Save Group.